Fitbit, the purveyor of fine wearable activity trackers, is hoping to capitalise on Nike's decision to abandon Android users, by giving them exactly what the sportswear giant won't. Following yesterday's news that Nike has no plans to launch an Android app for its FuelBand device, Fitbit has launched a sparkling new, and well timed, version of its own offering for Google-based devices. With the updated app, owners of the Fitbit One, Zip and Ultra now have access to wireless syncing over Bluetooth 4.0, meaning all data gleaned by the tracker will be sent back to the Android phone or tablet. The new functionality is only available to Samsung Galaxy Note 2 and Samsung Galaxy S3 users at present, but support for more devices is imminent, the company said. During the tech extravaganza, the company also launched the new wrist-based Fitbit Flex device which, like its stablemates, provides information on calories burned, steps taken, distance travelled and length/quality of sleep. 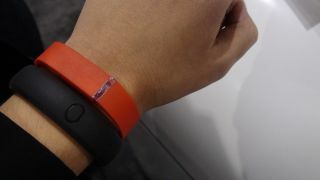 In anticipation of the Flex's launch, scheduled for sometime this spring, the new app has NFC support built-in also. The update is available to download from the Google Play store, but remember the fancy new Bluetooth 4.0 syncing feature is only available to Note II and Galaxy S3 owners at present.